“No one wants to help me. That’s what a woman who was prepared to jump off a bridge in Pittsburgh said to Major League Umpire John Trumpane. He just happened to be on the bridge when he saw her. And he ended up saving her life. It’s just as good over here. I’m better off on this side. “I’m not going to let you go. Trumpane grabbed her and was holding on tight. Both her feet were dangling off the bridge. “I just want to end it right now. With the help of others the woman was lifted over the railing. “All these people are here. Look at all these people who want to help you. Steph Chambers from the Pittsburgh Post-Gazette took these pictures. He’s the only one who got them. And the Post-Gazette gave me permission to show them. Chambers later spoke about how he got the pictures. I approached the group that hovered over a woman, who was wailing as she lay on the ground. I began shooting between the crowd’s legs. First, I focused on her face, and then a hand as it gently touched her. Her weeping was drowned out by Tumpane’s prayers as he tightly clenched her arm. That’s when I shot the picture. He looked her straight in her eyes, as tears and sweat mixed on her brow. Ambulance personnel strapped her arms against her chest, like a straightjacket, on an orange gurney. Still, he knelt by her and held her. 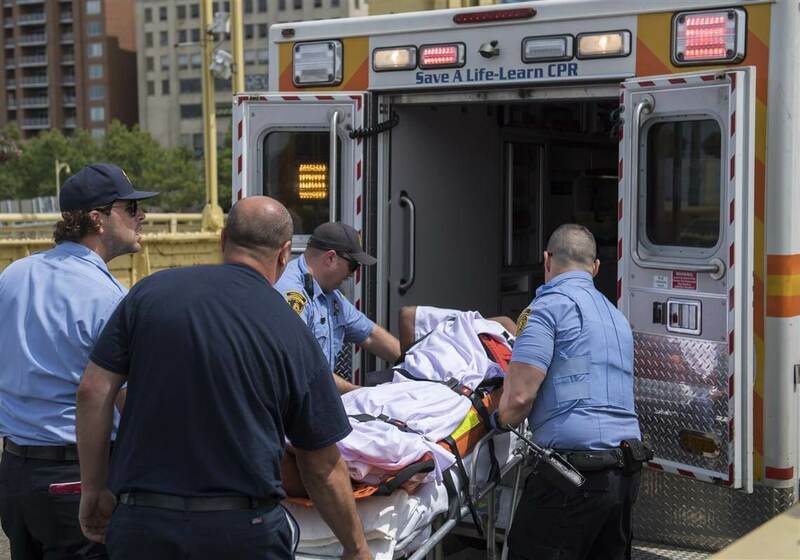 “You’re going to a safe place,” a worker said as he lifted the gurney into the ambulance. I really admire what John Trumpane did. He could have just called 911. But he got involved instead. And a woman is alive tonight as a result.